It’s the first day of December, the weather is balmy, and it’s also the first night of Hanukkah. The winter festival of lights came as somewhat of a surprise this year — I knew it was approaching, and I saw the growing quantities of jelly donuts at all the bakeries, but for some reason I never internalized that Hanukkah was approaching. Possibly because it still feels like summer. In fact, if it weren’t starting to get dark by 4:15 p.m., then there would be no way to tell it’s not summer. That said, I didn’t get around to planning anything too grand for the holiday. I knew I wanted potatoes to make latkes, but I kept forgetting to buy them. Fortunately, when I remembered a few hours in advance that it was the first night of Hanukkah, I had a few potatoes in the fridge already. Planning or not, I managed to pull together a lovely batch of latkes that take their inspiration from the fried potato patties of the Middle East, rich in vegetables, herbs and spices. Turmeric gives them a lovely golden color that I think we should get used to seeing in latkes. I fried them in a ceramic coated frying pan with only enough olive oil to help them brown, so they came out oil free enough that I didn’t even have to blot off the extra oil with paper towels. Far better than latkes whose primary flavor element is frying oil, if you ask me. Even if this does somewhat violate the spirit of a holiday focused on oil. Chop the celery and leek in a food processor. Put a grating blade on the food processor, and use it to grate the potatoes (if your food processor doesn’t do this for you, you’ll have to use a food grater. Watch out for your knuckles). 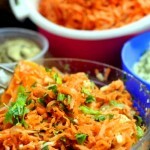 Mix the grated/chopped vegetables with the egg, the flour, the matzo meal and the spices. Heat a nonstick frying pan, and add a tablespoon or so of oil. 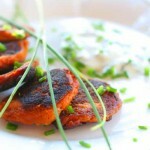 Drop heaping tablespoons of batter into the pan, and cook the latkes on a medium flame so that they can brown slowly. Flip once the bottoms are browned, and brown the other side. 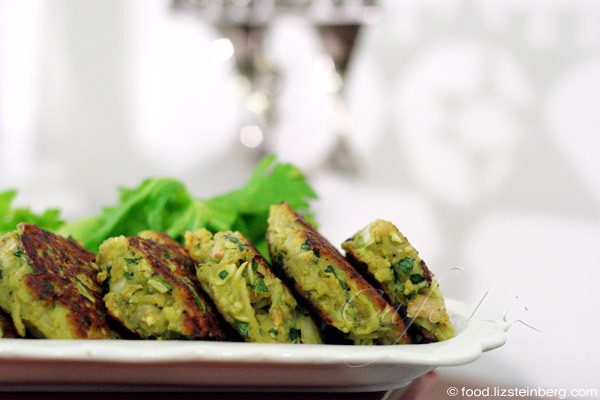 7 Responses to "Latkes with leek, celery and baharat"
What a lovely latkes recipe Liz! I avoid now potatoes because of the carb thing,but I think I could eat a few of these;D Happy Chanukah! These were amazing! I’m certain it was the baharat that was that special something. Thanks for having us over. Loved loved loved the soufganiot. The only ones I had this year. these look amazing. i may have to give ’em a try even though the holiday has passed! you think they’d be any good if i baked them instead of frying? Hi Shara, thanks! 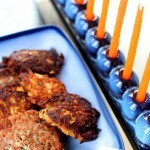 Yes, they’d probably be good since they’d contain all the same flavors, although I’ve never made baked latkes before. I don’t know how this would change the texture. Hmmmm…so I may try baking a few and if they’re bad, I’ll fry. I’ll update you! Good plan! I’m curious to know how it’ll come out.